In this example of the ElementalAnalysisPlugin we demonstrate how to use the Calculator Plugin API step-by-step. These steps are common for all types of plugins. 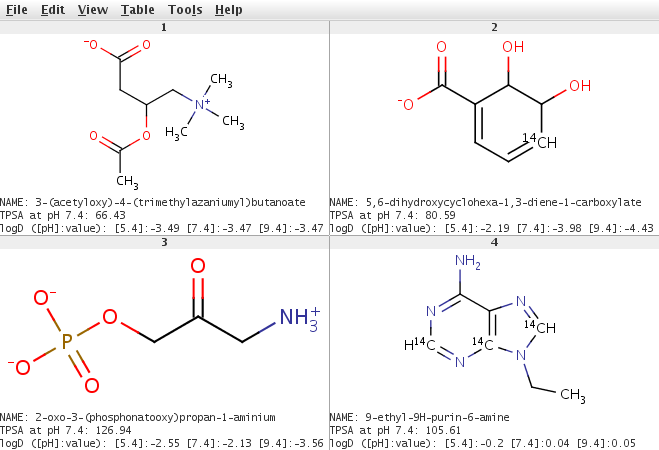 In the second example four plugins are used: the MajorMicrospeciesPlugin to generate the major microspecies at pH 7.4; TPSAPlugin to calculate the polar surface areas; logDPlugin to calculate the logD values; IUPACNamingPlugin to generate the names of molecules read from a molfile. 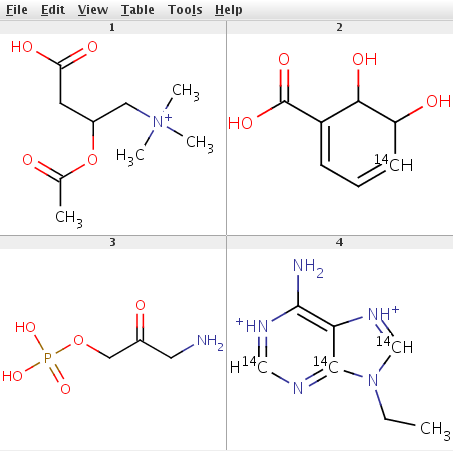 The results of the calculations are written to an SD file: they are the major microspecies of the input molecules, the IUPAC names, the surface area values and logD values. The main steps in this example are the same as in the previous one, only the methods used for parameter settings and the methods used for getting the results are different. For setting the parameters method setpH(double) is used. Major microspecies at the specified pH will be generated. For getting the results method getMajorMicrospecies() is used. It returns a Molecule object. For setting the parameters method setpH(double) is used. For getting the results method getSurfaceArea() is used. There are quite a few parameters that can be set for logD calculation. These are: Cl- ion concentration, Na+/K+ ion concentration, pH (for calculating logD at a single pH value), pH lower limit, pH upper limit, and pH step size. The results of the logD calculation are returned by the method getlogDs(), the pH values are returned by the method getpHs(). Both methods return a double array (double), the logD array contains the logD values for corresponding pH-s in the pH array. For getting the results method getPreferredIUPACName() is used, it returns the preferred IUPAC name. IUPACNamingPlugin has also the method getTraditionalName() to return the traditional name of the molecule. The result is written to the results.sdf file. The above examples can also be run by run.sh shell script (Linux/UNIX) or RUN.BAT batch file (Windows).